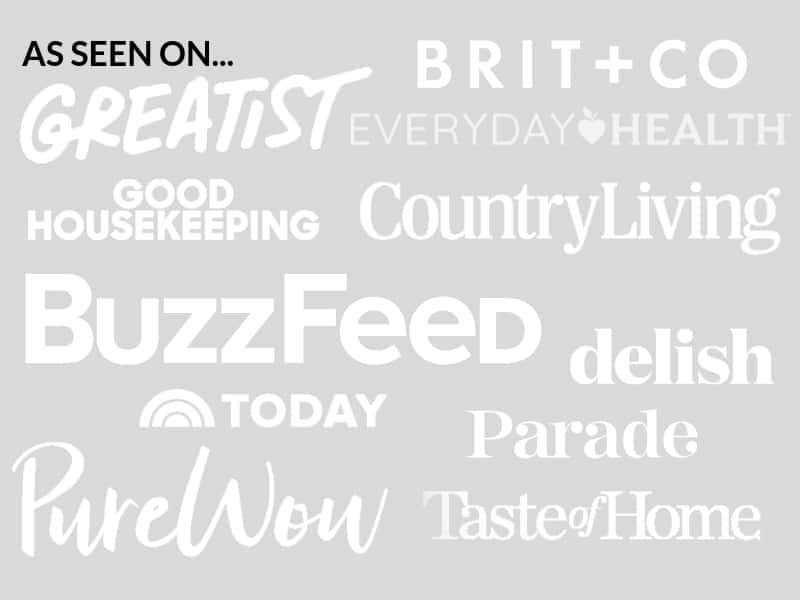 July 14, 2015 By Elizabeth Lindemann 6 Comments / This post may contain affiliate links. First, the produce is significantly less expensive than it is in Massachusetts, probably because there is a much better selection of local, seasonal selections (and because the cost of living is generally lower). In the peak of July, zucchini and corn abound. Oh, and the TACOS! Everywhere you look, there’s a taco truck or a taqueria. In the grocery store (HEB is my new favorite place in the world! ), there are fresh baked tortillas every day that are still warm when you put them in your cart. STILL WARM! So with my zucchini, corn, and fresh tortillas (oh, and avocados the size of your head! 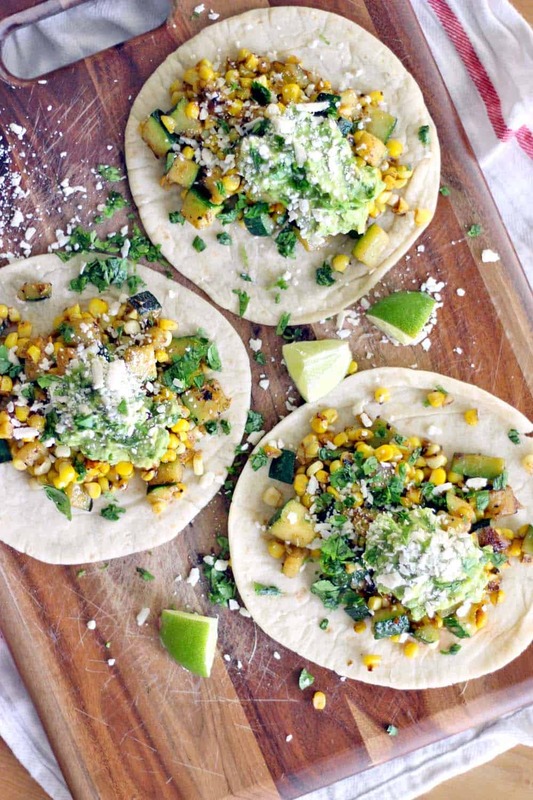 ), I made some healthy and delicious Zucchini and Corn Tacos with Fresh Guacamole! YUM. These tacos are simple, very good for you, and plant-based. 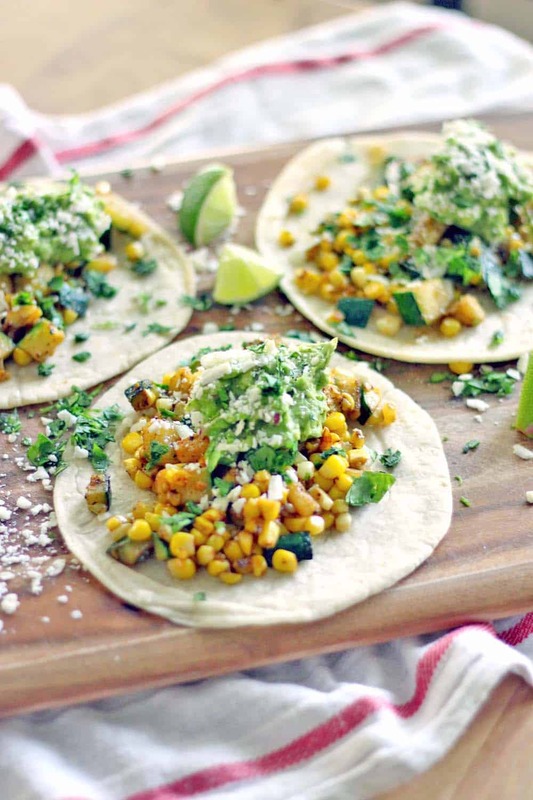 They have a bit of a kick to them but are still simple in flavor (the squash and the corn aren’t masked by too many spices) and are the perfect light and healthy summer lunch or dinner. AND, they take only 10 minutes to make! First, dice the zucchini and cut the kernels from the corn (hold the corn vertically over a medium-sized bowl and run a knife, carefully, along the edge the cut the kernels off). Mix the zucchini and corn in the medium bowl with just a little bit of olive oil, salt, pepper, cumin, and cayenne pepper. Saute the vegetables over medium-high heat. Don’t stir them too much- you want them to brown and char slightly to enhance the flavor. Side note- keep an eye on them, and don’t cook for too long! Otherwise, the fresh corn will start flying from the skillet into the air like popcorn. Yes, this happened to me. The kitchen was a danger zone for a while there. While the vegetables are cooking, make the guacamole. Guacamole is one of the easiest things in the world to make, and I have a couple of tricks to make it taste extra yummy. Just mash up two small (or one Texas-sized) avocados in a bowl and add some lime juice, salt, and pepper. That’s really all you need in a pinch, but I also add some fresh chopped red onion, cilantro, and some cumin and cayenne pepper to spice things up a bit. That’s it! Top some tortillas with the zucchini and corn mixture, and dollop some guacamole on top. Add some cotija cheese, lime juice, and extra cilantro, if you want (I had leftovers of this amazing cheese from making Mexican risotto the other night, and I highly recommend you go buy some immediately). So next time you have too much zucchini to know what to do with it all, or if you find yourself craving a lighter, healthier taco, try this super easy, fast, and delicious meal. Be creative with it- add some peppers and onions to the mix, or top with your usual taco fixings like crunchy lettuce or sour cream or hot sauce. You really can’t go wrong! 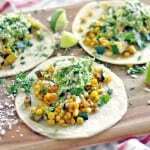 These vegan tacos are simple and healthy, have a bit of a kick, and take only ten minutes to make! Mix the corn and zucchini together in a bowl with the olive oil, 1/2 teaspoon cumin, pinch of cayenne pepper, and salt and pepper to taste. Saute on medium-high for about 5 minutes, stirring occasionally (but not too frequently). Meanwhile, make the guacamole in a small bowl by mashing the avocado and combining with the lime juice, 1/2 teaspoon cumin, pinch of cayenne pepper, salt, pepper, onions, and cilantro. Warm the tortillas briefly in the microwave. 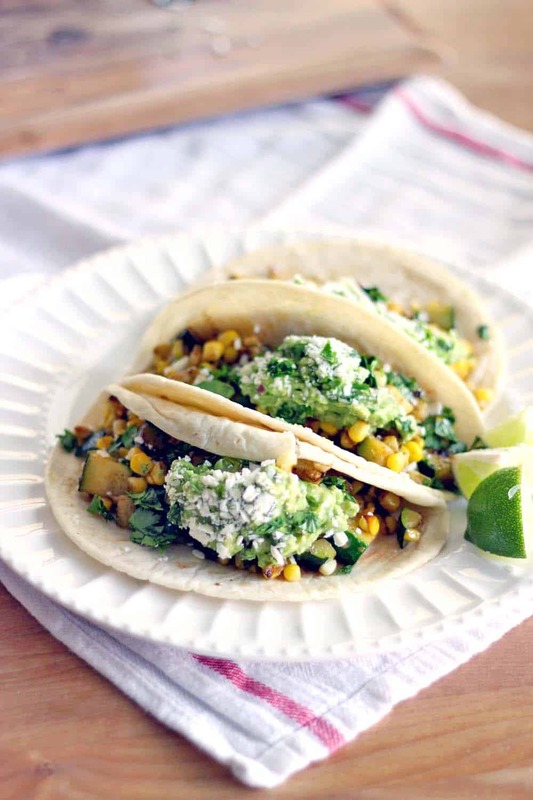 When vegetables are browned, serve on top of the tortillas with a dollop of the guacamole and optional cilantro, lime wedges, and cotija cheese. i can usually find some aspect of a vegan recipe that i don’t like, but that’s not the case here–these are incredible!